It’s bad enough if a child can’t get to school because of lack of mobility or distance. Imagine the indignity of a child being denied access to school because he or she can’t use the school toilet. It’s not a challenge – a humiliation – you’d wish on your own child or any other child, certainly not a sweet, smart kid like Shamiso. When I met Shamiso, she didn’t say much but I could see determination in her eyes. “I want to be a nurse,” she told me, her voice barely above a whisper, a smile breaking over her beautiful face. Roll back the tape a few years to when our community worker first found Shamiso. Legs limp after a battle with polio, Shamiso couldn’t stand; she crawled along on the floor. But she dreamed of going to school. And she was willing to work hard for her dream. Our dedicated physiotherapists worked with Shamiso to get her up and walking. They gave her parallel bars to help strengthen her arms. Slowly, slowly, they trained her how to walk. With sheer grit, Shamiso pulled herself up onto crutches and willed her legs to move, demanded her muscles to grow stronger. Finally, she was strong enough to go to school! She was determined and so were we! Because her family couldn’t afford the fees, we stepped in and paid the fees. Because the closest school was two miles away – over of grueling terrain – we made sure Shamiso got a wheelchair. We were ready to celebrate… Shamiso was going to school!! But then, the door slammed shut. Why? Because the Zimbawbe government wouldn’t allow her to attend school because her wheelchair wouldn’t fit into the school’s toilet stall. Can you imagine that happening here in Canada? Can you imagine being told that your child can’t attend school because their wheelchair doesn’t fit into a school toilet stall? You’d take the school to court so fast their heads would spin. You’d call the media if you didn’t get action. This is the difference between accessibility and inclusion. It’s one thing to add a ramp to the front stairs of a school. It’s another to ensure a child gets all she needs to be successful at school. The story for Shamiso did not end there. I was inspired by the vision of the village – the community around Shamiso. They had a meeting and collectively said it was a “shame” that Shamiso could not go to school because of a toilet. They met with the Principal, and then met with several other local groups, and cobbled together enough money to build an accessible toilet. 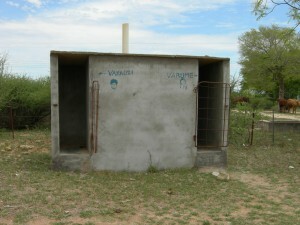 When I visited the school, the toilet was almost completed. It may seem like a funny thing to say, but I was so proud to be paraded through an accessible pit latrine in the rural area of Zimbabwe. That pit latrine, with its wide door, was the gateway to a new future for Shamiso! You can watch a glimpse of the construction. This coming week, May 4-10 is the Global Campaign for Education’s (GCE) campaign “Equal Right, Equal Opportunity: Education and Disability”. According to GCE, thousands of schools in over 90 countries will take part in this campaign. In developing countries like Zimbabwe, a child with a disability like Shamiso is twice as likely to have never attended a school as a child without a disability. Visit www.campaignforeducation.org for ideas. Contact your MP and encourage them to influence the Department of Foreign Affairs Trade and Development (DFATD). Shamiso is on her on way to fulfilling her dream of being a nurse. Together, we can do this for more children like her who deserve a chance to shine. Shamiso couldn’t attend school because her wheelchair wouldn’t fit into the school’s toilet stall. Do the Stones Need to Talk for Us?